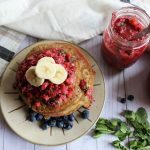 Inside Scoop: This recipe for gluten and Dairy-free Buckwheat Pancakes are perfectly topped with a delicious Mint Berry & Hemp salsa, the perfect breakfast pair. If you are anything like us then your favourite meal may just be breakfast. You may or may not also have a sweet tooth, and on most days have very little time to prepare the wholesome and delicious breakfast you literally just had dreams about. 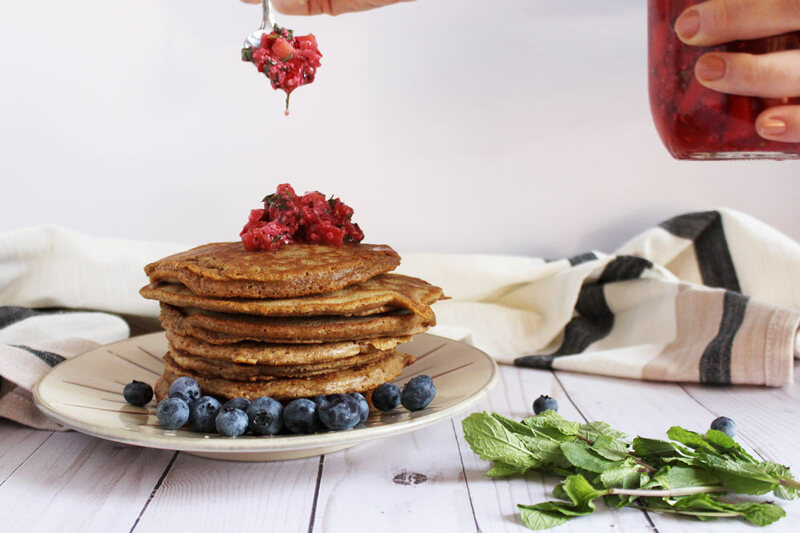 Well well, these dairy-free buckwheat pancakes are going to make your night time dreams become real life! Not only are they easy to prepare, gluten and dairy-free, but they are made with healthy ingredients and are really an effortless choice. The thing that really makes these dairy-free buckwheat pancakes stand out though? 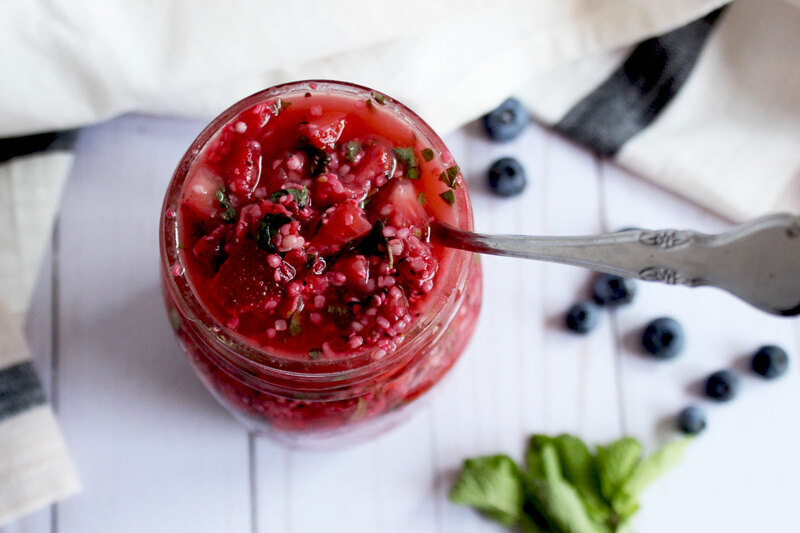 The Mint Berry Salsa is like blend between a compote, a fruit salad and a sweet salsa, and it’s packed with antioxidants and bursting with divine flavours. Better yet, the salsa can be made in advance and stored in your fridge ready to top your meal or simply drench it….yeah we said it! Homemade anything always tastes better, and is way more satisfying, but with little to no time in your day it’s easy to stroll down the aisles of the grocery store and mindlessly throw things into our cart. So instead of grabbing the pre-mixed pancake batter, that’s often loaded with artificial ingredients, why not grab a pack of buckwheat flour and set aside 1 minute in the evening to prep the batter! Nerdy side fact: when you see the term “enriched” it basically means stripped of about 15 nutrients with 5 synthetic ones added back in. Refined grains often have lower fibre, protein, and phytonutrient value. This little recipe for dairy-free buckwheat pancakes contain ZERO trans fats, contains whole grains, fibre, healthy fats, and protein. Win, win, win, win etc. 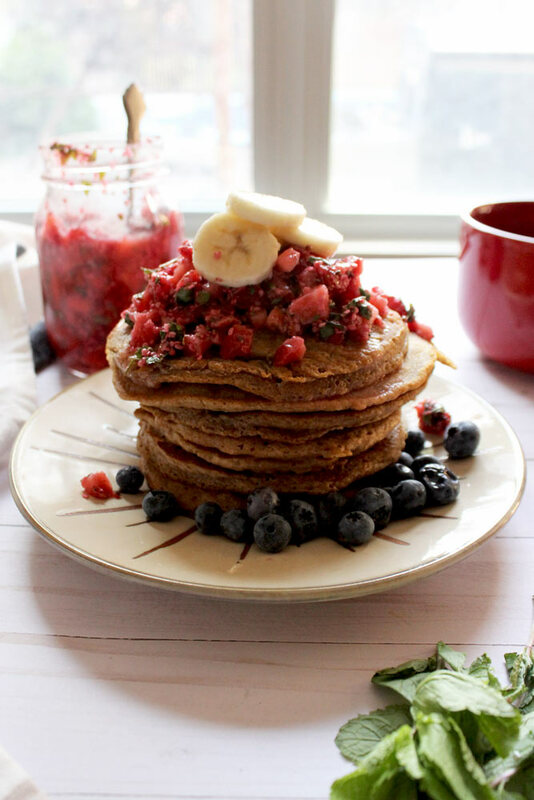 Have we convinced you to try these Dairy-free Buckwheat Pancakes yet? If not, here are our favourite reasons for whipping up a batch today: gluten-free, versatile, and crowd pleaser. Gluten is something that we are overexposed to, can compromise our gut, and you know what they say: “everything in moderation”. If you have not tried buckwheat here is your reason to do so, it has a rich, nutty flavour, is loaded with fiber and promotes blood sugar stability and satiety; thus perfect for those busy mornings where you need to get your A game on. Keeping nutrition easy is a main motivator in our busy lives, and this is exactly why we created a simple 5 ingredient challenge that will get you cooking the easiest healthy meals in minutes. Make sure you sign up for our 5 Ingredient Challenge, and instantly get access to our 5 Ingredient Cookbook, and get 5 days worth of daily emails with a tip a day on how to live a healthier lifestyle. If you’re looking for more ways to get buckwheat into your life, your going to love this recipe for Chilled Sesame & Carrot Soba Noodle Bowl. How do you feel about buckwheat flour? If you are anything like us your favourite meal is breakfast, you've got yourself a sweet tooth and most days you have absolutely no time to even prepare the wholesome, delicious breakfast you are dreaming of. Heat waffle iron and oil lightly. Add wet ingredients and whisk by hand until smooth. Pour one third of the mixture into waffle iron and follow manufacturer’s directions. 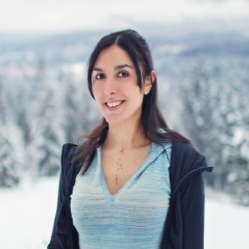 *If you don’t have a waffle iron, this recipe also makes tasty pancakes! If you have it sit overnight it makes the salsa sweeter. *If you don’t have a waffle iron, this recipe also makes tasty pancakes! If you have it sit overnight it makes the salsa sweeter. Mint Berry Hemp Salsa not tickling your fancy? 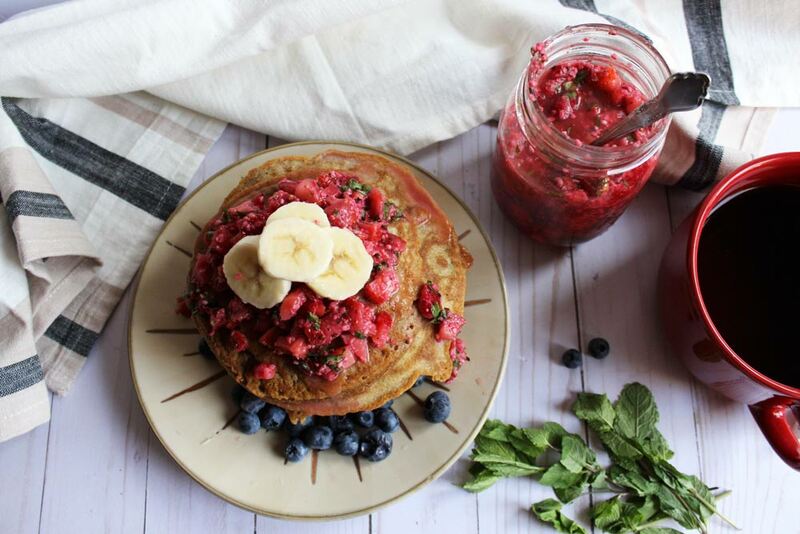 Try this 3 Ingredient Strawberry Chia Jam as a pancake topper.